Does Your Spouse Have a “Smartphone” Addiction? messaging, video messaging, text messing, and voice communications, as well as through social media and emails. For some people, the allure of being connected can start to develop into an addiction and could be as severe as a drug addiction. Unfortunately, many couples experience the effects of this newest addiction first-hand. They may be the one completely tuned out to those around them or the loved one, who feels isolated and alone. 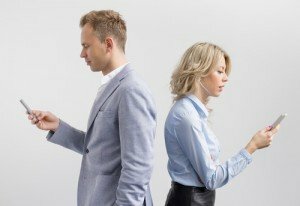 In some cases, when one spouse develops a “smartphone” addiction, it acts as an enabler for the other spouse, who eventually could also develop similar behaviours. Long before “smartphone” addictions become serious, there are several key indications a “smartphone” addiction could become an issue. Recognizing these signs earlier rather than later, can make addressing the problem easier for some people. Do you feel “cut-off” if you do not have access to your smartphone? If you have ever lost or broken your phone, you may have experienced an overwhelming sense you could not connect with others electronically, which could actually have been similar to withdrawal symptoms experienced by recovering alcoholics and drug users. Does interacting through your phone become the primary way you communicate with people? For some people they would rather just use their phone for all forms of communication, even when carrying on conversations with their partner, rather than talking verbally face-to-face and could indicate an addiction to your smartphone. Is the need to be on social media or other app become more important regardless of who is around or what you are supposed to be doing? This often signifies the start of addiction-like behaviours, such as having to constantly check your status on Facebook, even if you are supposed to working or performing some other task. Does responding to alerts on the phone become normal, even during intimate encounters with your partner? Reaching for your phone to respond to a text, tweet, or take a call instead of enjoying the moment with your loved one, indicates there is a problem, not to mention the other person will not find this behaviour amusing or romantic. On the other side of this issue is the person, who notices the addiction and feels like they are no longer relevant or important because they are being ignored. If you feel like you are alone or isolated, even though your spouse is in the same room, you should be concerned, too. You might question what is wrong with you or why your partner no long finds you interesting. If you spouse is sitting directly across you at the dinner table, yet you feel like you are dining alone, it is time for both of you to seek help. For assistance with addressing concerns over a smartphone addiction that is affecting your relationship, contact Bayridge Counselling Centre today at 905-319-1488 to schedule a consultation appointment today!